Kids normally aren’t shy when it comes to writing their wishlists to Santa or telling you what they want for Christmas this year. But with so many toys on the market, it can be difficult to know what to put your money toward! We’ve narrowed things down to the hottest toys in stores today. As in recent years, it’s all about tech, from interactive pets, to drone racers, to extensive play sets. Better get a jump on your Christmas shopping now as these toys are flying off the shelves! A cross between a Furby and Tamagotchi, Hatchimals are the newest toy craze, allowing kids to interact with and take care of their pet. One of three breeds may be inside the egg, but the Hatchimal will only come out as a result of constant touch and interaction. After it hatches, kids can raise the Hatchimal through three stages of growth: baby, toddler and child. Good luck finding one for Christmas, however. 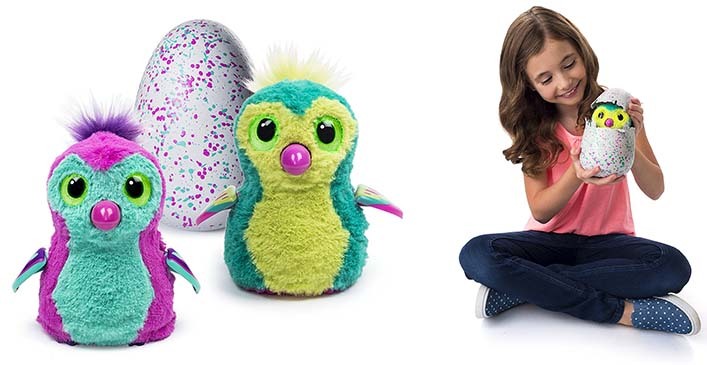 Hatchimals are already sold out in Toys “R” Us and most other stores, although some are available on Amazon or Ebay for three times the price.